Every year, Americans partake in observing National Hispanic Heritage Month from September 15 to October 15. This tradition began in 1968 and enacted into law in 1988. I generally don't observe much here on my blog, but I made it a point to partake in this holiday. The month is dedicated to honoring all the Hispanos who came before us and paved the way for the rest of us. Today I'd like to honor a lady who I hold dear to my artistic heart, The Crafty Chica, Kathy Cano-Murillo. I met Kathy 2.5 years ago at CHA. At the time, Bela was 6 months old and the youngest at the event. I remember approaching Kathy's table very slowly and with much shyness as I had recognized her from her videos. She was very friendly and warm. Inviting. Inspiring. I created my make-and-take with her and was off. That night I remember getting home and playing with my paints in my journal. I found the courage to paint in my journal, and create art. Undefined art, expansive art, my art. That was how I began my art journaling journey. With no fear and always remembering there is room for everyone, which is something Crafty Chica believes, and so do I. She was touring Los Angeles and surrounding areas to promote the launch of her line at Michaels. 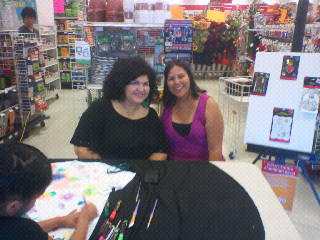 I was lucky enough to meet her at my local Michaels store for her in store appearance. Her Juicy fabric inks (which I purchased) were laid out in front of a white t-shirt and we were offered to paint and try and play. Lalibela, my daughter, enjoyed doing just that. The cool thing about the markers is they can be used with water...and it gives the watercolor effect! I immediately imagined all the possibilities, and the upcoming post featuring said markers. As I was saying, I'd like to honor Kathy for paving the way in an industry in which very few Hispanic Artist have prospered. She inspires me to be true to my artistic self, and for that I'm grateful. Paint Oil Cloth Shoes/Heels however you want. I'll be doing this Paint Drip Pumpkin this year. How adorable is this Emapanada Pin Cushion?! Lastly, her Artists Tips are fantastic!! I hope you shoot on over to her blog and check out her work. She has something for everyone and her daughter, Maya, also crafts and creates for teens! They are one crafty family and I admire them. Love that we can celebrate our heritage!